Google showcased an innovation for its mobile payments app Google Pay on Wednesday, wherein merchants at stores can initiate payment requests by punching in a customer’s mobile number on their point-of-sale (POS) terminals. With this the California-based firm is taking on PhonePe and Paytm in their own home ground and is also challenging its US rival Amazon. Google also unveiled two other services through which its payments application users can book train tickets and buy gold. “Digital payments has been a phenomenal story for India,” said Ambarish Kenghe, director, product management, Google Pay, India. “We want to address use cases that are close to our (customer’s) heart.” Unified Payments Interface (UPI) transaction volumes have outpaced all other forms of digital payments including wallets, mobile banking, and credit and debit cards. It has grown 40 times in 18 months, from 17 million transactions in August 2017 to 673 million in February 2019. Google Pay’s monthly active users have grown three times, from 14 million in March 2018 to 45 million in March 2019. 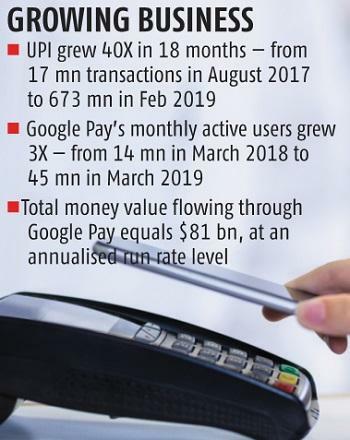 Total money value flowing through Google Pay equals $81 billion at an annualised run-rate level. 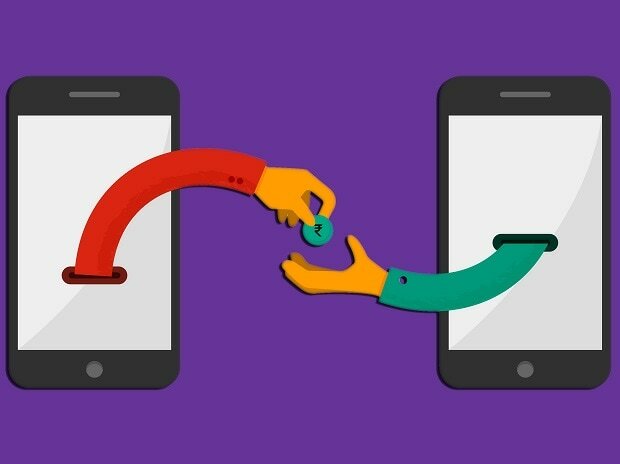 Google Pay is betting big on this growth and has formed partnerships with payments companies Pine Labs and Innoviti to enable UPI payments across a massive footprint of POS terminals spanning 200,000 stores in over 3,500 cities and towns. “The reality is that hundreds of millions of Indians still go into the stores to buy and transact. We are going to enable thousands of large-format retail stores (transact) through Google Pay,” said Sajith Sivanandan, Business Head, Google Pay, India. Google said it would start with stores such as Reliance and Vishal Mega Mart, and the company would eventually reach out to smaller towns and villages. Google Pay is already used across 300,000 cities, towns and villages in India and two of every three transaction comes from beyond the metro cities. The digital payments space in India is expected to rise fivefold to reach $1 trillion by 2023, and it would be led by the growth in mobile payments, according to a report by financial services company Credit Suisse. Pine Labs said that, through the new collaboration, Google will have access to over 330,000 point-of-sale terminals in over 3,000 towns. Pine Labs’ solutions are used by merchants from sectors such as electronics, food and beverage, fashion, pharmacy, telecom, and airlines. It enables online and offline last-mile retail transactions for over 100 brands. Pine Labs-branded POS terminals in offline stores can be used by merchants to process Google Pay using a secure, two-step process. Merchants can initiate a payment request using a Google Pay user’s mobile number. The user can then authenticate this request via their Google Pay app for the payment to be processed. Both the merchant and customer will get instant notifications on the completion of a transaction.